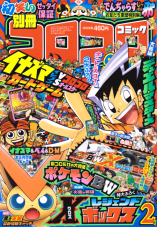 Pocket Monsters BW The Hero of Thunder and Fire originally started publication in the February 2011 issue of CoroCoro Special. Note: The following summary will be taken down and replaced with a less detailed summary if Viz ever picks the series up for distribution in the United States. In a town in the Isshu Region, a little girl's Monmen is being stolen by three members of the Plasma-Dan. One of the members, a man with pointy hair named Togari, tells the girl that her pokemon now belongs to them. Suddenly, a voice from the distance tells them to stop. When the Plasma-Dan grunts look around, they see a boy and his Pokabu standing on the roof of a tall building! 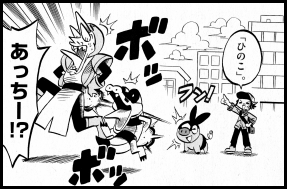 When Togari asks who he is, the young boy strikes a pose and announces that he is Shin, the Pokemon Trainer of Justice! His Pokabu uses its Ember attack behind him for dramatic effect. Shin and Pokabu act like they're about to jump off the roof but turn around at the last minute and take the stairs instead! As the grunts wait, Shin and Pokabu make their way down the five story building. They finally arrive on the ground floor but are exhausted, so they make the Plasma-Dan grunts wait for them while they catch their breaths. Togari wonders if this boy could really be the Pokabu trainer who's been giving the Plasma-Dan such a hard time lately. After recovering, Shin tells the Plasma-Dan grunts that he won't lose to them. Togari decides to battle and sends out his Meguroc to fight Shin's Pokabu. Meguroc is ordered to use Bite attack, but Pokabu surprises its opponent by speedily getting out of the way at the last minute. Pokabu uses Ember on both Togari and Meguroc, sending them running away. Shin returns Monmen to its trainer and waves goodbye to her. Shin looks down at his Pokabu and says that he knows there's more to the Plasma-Dan than just those three grunts they were able to defeat. If he doesn't defeat the "king," he says, he won't be able to say he's truly beaten the Plasma-Dan. Just then, Shin senses a presence behind him and turns around. He isn't able to see anything, however, and dismisses it as his imagination. Meanwhile, a young man in a cape and his Choroneko watch Shin from the distance. In an alley somewhere, Togari is still suffering from Ember's effects. Togari tells his underlings that the "king" of the Plasma-Dan is rumored to be a very strict person who does not tolerate failure of any kind. He decides that the best way to avoid any sort of punishment is to defeat Shin and his Pokabu and prevent them from interfering in the gang's plans anymore. Shin is walking along the street, ready to go to the next town. He looks ahead and sees the young caped man and Choroneko who had been watching him earlier. Shin introduces himself as a Pokemon Trainer and asks the young man if he's a trainer as well. He responds by saying he's just a traveler, much to Shin's disappointment. If the young man was a trainer, Shin says, the two of them would be able to have a pokemon battle. The young man responds to this by abruptly asking Shin if he wants to hurt his pokemon. Shin says that of course he doesn't and is about to explain what he means when a Plasma-Dan grunt runs out and takes the young man's Choroneko! The two grunts who were with Togari taunt the two young men, telling them to come and get it if they dare. Shin immediately runs after them. The young man tries to stop him because it'll be dangerous, but Shin ignores him and tells him to come on. The young man looks into Shin's eyes and sees that he truly does want to save his pokemon, so he decides to let him come along. Shin and the caped young man chase after the Plasma-Dan grunts. 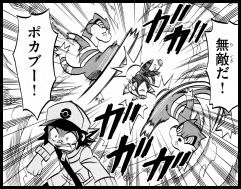 Shin orders Pokabu to use Tackle, hitting one of the grunts in the back. The grunt carrying the Choroneko throws it to the other grunt before passing it to Togari. Togari takes off with Choroneko under his arms and laughs as he lures Shin into his trap. Deep in a nearby forest, Shin and the young man have lost sight of the Plasma-Dan. As Shin tries to get his bearings, the young man asks him why he's getting himself so worked up over someone else's pokemon. Shin explains that before he was a trainer, he went out on a journey all alone. He encountered many obstacles that he couldn't overcome by himself, so he became a Trainer and started on a journey with his Pokabu. The young man takes all this to mean that Shin just uses pokemon for his own benefit. Shin denies that that's the only reason, adding that he and his pokemon are able to learn a lot from each other. He concludes his explanation by saying that being with a pokemon is more fun than not being with one. The young man asks if that's the only reason, and Shin says it is. Shin then says that he'll return the stolen pokemon so everyone can be happy. The young man wonders if doing this will really make everyone happy. At that moment, the young man tells Shin that a pair of nearby Mamepato are talking. He tells Shin that the bird pokemon are saying that a group of suspicious people are at the rocky stretch just ahead. As Shin wonders what just happened, the young man tells him that he has the ability to understand pokemon speech. The young man asks if this is weird; Shin responds by calling him amazing and asking if he can teach him how to do the same. As Shin runs ahead, the young man thinks to himself how strange this trainer is. Eventually, Shin finds the rocky stretch and Togari. The Plasma-Dan grunt is still holding Choroneko under his arm. Shin demands he return the pokemon; Togari, of course, refuses. He sends out Waruvil, so Shin prepares his Pokabu for battle. The young man watches the battle from a distance, wondering how humans are capable of injuring their pokemon by commanding them to attack one another. Waruvil starts the battle by using Sand Attack. This kicks up a cloud of sand that prevents Shin and Pokabu from being able to see their opponent. Togari explains that the dirt at the rocky stretch they're at is particularly small, enabling him to create an opaque cloud of sand. Shin gets frustrated at the fact that he can't attack in these conditions but is relieved to think that Togari's Waruvil won't be able to attack, either. Suddenly, a Meeruhog appears out of nowhere and strikes Pokabu with its tail! The cloud of sand prevented Shin from seeing Togari release a second pokemon, catching him off guard! Togari explains that Meeruhog is able to see through the cloud of sand by using its "Keen Eye" Ability, making it invincible! Meeruhog hits Pokabu over and over before Shin orders it to use Ember. The attack misses, hitting the ground just in front of Togari. Meeruhog counters by kicking Pokabu in the chin, sending it flying into its trainer's arms. As Shin asks his pokemon if it's OK, the young caped man steps forward and tells Shin that he's injuring his pokemon for nothing. He tells him to stop the battle and run away, but Shin refuses to quit until he's saved Choroneko. The young man asks if he wants to help pokemon just to make himself feel better, adding that this desire has caused his pokemon pain and suffering. Shin vehemently denies this, reminding him that he said that earlier that being with pokemon is more fun that being without them. 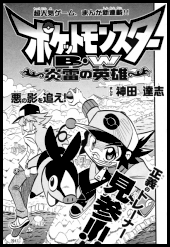 He adds that for the pokemon, being together with a trainer is more fun as well and that the one who's suffering the most right now is the kidnapped Choroneko. The young man is shocked to find that Shin's Pokabu feels just as strongly about this as Shin does. Togari laughs at Shin. 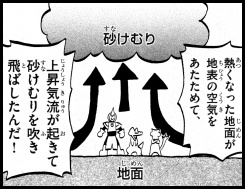 Meeruhog is still running around in the cloud of sand, attacking both Pokabu and Shin. The young trainer looks for a way to get rid of the sand and notices a spot by Togari's foot. He wonders why he can see that but nothing else before remembering that that's the spot where his Pokabu's Ember attack hit. Shin comes up with a plan and asks Pokabu to help him out. The young man protests and says that Pokabu's at its limit, but Shin ignores him and asks Pokabu to use Ember again. As the fire pokemon fires off Ember attack after Ember attack, Meeruhog dodges them easily. Togari laughs at Shin, but Pokabu is asked to continue firing off attacks. Finally, Pokabu reaches its limit and isn't able to use Ember anymore! Togari laughs and says that Pokabu's useless struggles have finally come to an end. Waruvil digs underground while Meeruhog leaps forward. Meeruhog is about to emerge from the cloud of sand when the wind blows it away! Togari wonders what happened to his cloud of sand; Shin explains that the aim of Pokabu's Ember wasn't to attack, but to warm up the ground. The young man sees what Shin was aiming for; by warming up the ground, the air just above the ground warmed up as well, causing a convection that brought about a gust of wind! Now that Shin and Pokabu can see their opponent, Pokabu pushes forward with Nitro Charge! Meeruhog, Waruvil, and Togari are all sent blasting off while the young man's Choroneko falls safely to the ground. As Shin celebrates, Pokabu begins to glow. Before he knows it, Shin's Pokabu evolves into Charbu! The young man, whose cape had blown off, thinks to himself how Shin really is a strange one. Later, Shin tells the young man that he's happy Choroneko was returned. The young man thanks him for all his hard work. Shin realizes that he never caught his name, so he asks. The young man tells Shin to call him "N." Shin tells N that it's dangerous for him to travel alone, so he offers to accompany him on his journey. With the idea that being together is more fun than being alone, Shin, N, Charbu, and Choroneko head to their next adventure.